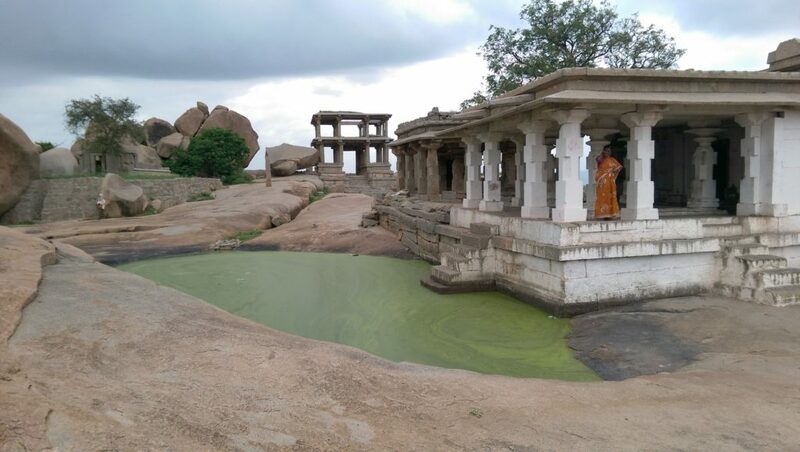 Situated inland, in the mid-Northern part of the state of Karnataka, India, the village of Hampi has to be close to the most surreal place I have ever visited. Boasting over 500 ruin sites and an incredibly chilled atmosphere to complement them, Hampi is a location that is loved by backpackers from all over the world. 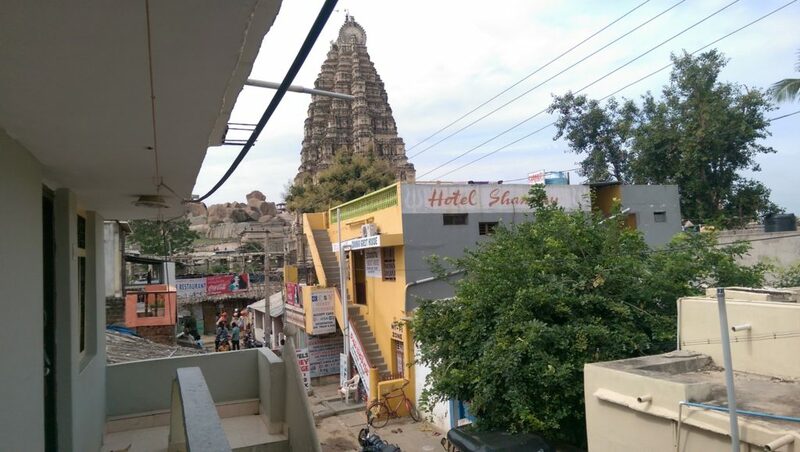 I arrived in Hampi very early in the morning and was able to check in to my guesthouse and sleep. It wasn’t until I woke up and emerged from my room, with the sun now shining, that I realised the amazing extent of my surroundings. The Virupaksha Temple, one of the main sights, towered above me to my left. My little, dusty street in the heart of Hampi Bazaar, which was suitable for rickshaws at best, was lined with colourful little two storey guest houses and it made me feel like I’d gone a long, long way back in time. The broader landscape is hilly and covered with large, bulbous boulders and would make it seem like a desert if not for all the palm trees and other greenery that cover the remaining boulder-less and ruin-less patches. The ruins seem to stretch for miles in every direction and are an explorer’s heaven. You are pretty much completely free to wander amongst them at your leisure. Plenty of tour companies run busses into Hampi from various major locations. Just check the net, you guide book or ask around at your hostel. The nearest city and railway station is Hospet and many of the busses will set down there. It’s then easy to get a rickshaw into Hampi. I got to Hampi from Goa. I caught an overnight bus from Panjim, which was comfortable enough. The travel agent that I booked the bus with in Goa was smart enough to book me a double bed, predicting that nobody would book the other side of the bed (the bus wasn’t nearly sold out). The risk paid off and I had a heap of room to myself. This particular bus took us right in close to Hampi, which was convenient. Guest houses are everywhere in Hampi. The river is a dividing point that you’ll no doubt hear about. The side of the river that has the big temple (Hampi Bazaar) is strictly no meat or alcohol**. However, get on the “ferry” (a little motor boat with a few seats) or in a local fisherman’s bowl and you can access all the beer and chicken you want on the other side. I had originally intended to stay on the drinking side of the river, cause, you know, I’m an Australian backpacker. This did not end up happening due to the fact that there are two guest houses, completely independent of each other, with the exact same name. I unwittingly booked the “Gopi Guesthouse” on the temple side. It did turn out to be a good guest house though. And we ended up just crossing the river in the afternoon for a beer anyway… But be careful. The last ferry runs at 6pm and the fishermen with the boats are all asleep come 10pm. Needless to say, we were having too much fun at the Gopi Guesthouse (also known as Gopi Island) that we were meant to be staying at and we got stuck. Luckily the friendly management had a spare hut available and we were able to crash there for the night for a very generous price. Grab a travel buddy and pay a rickshaw driver to show you around all the ruins for half a day to a day. It won’t cost you much, it couldn’t have been more than 800 rupees each between two of us. Our driver’s name was apparently Anaconda and he was an enthusiastic dude. The drivers know where to go and, trust me, you won’t have any trouble finding one. There is also plenty to explore close by to Hampi Bazaar, which you can easily just do on foot. Walk up the hill by the big temple for a cool view of the village and the landscape (as well as more ruins). On the Hampi Bazaar/Temple side of the river “Mango Tree” is excellent. Veg only of course, the food is delicious and there’s a good variety. There are a bunch of sit down tables with cushions creating a relaxed atmosphere. Meals are fairly cheap too. As mentioned, you can go to Funky Monkey for a rum. Again it’s got a cool, chilled atmosphere with decent tunes playing at night and games available to sit down and play. And also as mentioned, Gopi Island across the river for drinks and meat! There are other options as well, but not that I visited, check Trip Advisor. Hampi is a must see when travelling in South India. I only had a 2-night stay (but arrived very early on my first day and left quite late on my last day) but if you have the time I’d recommend staying longer than that. Aside from the wondrous location, it’s a great holiday place to just sit back and relax.